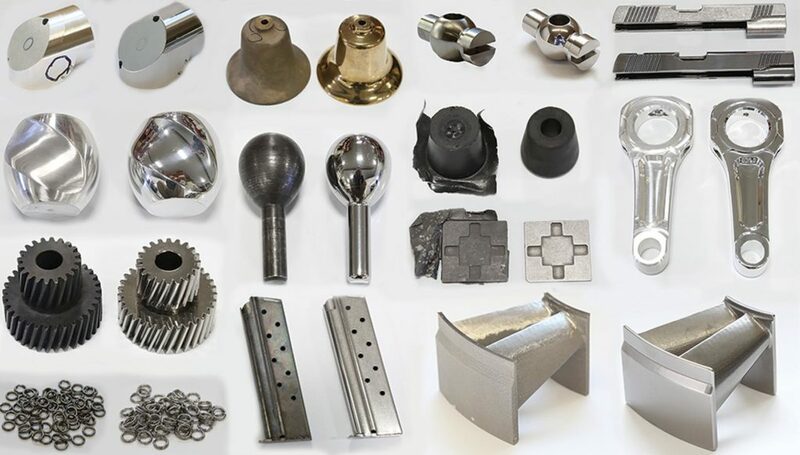 Before Mass Finishing, Inc. got its start in 1995, many of the medical companies were using barrel polishing machines and vibratory polishers for finishing medical parts such as hips, knees, bone screws, etc. That tradition continues today as the medical industry still relies on Centrifugal Barrel Finishing Machines and our other lines of vibratory polishers to give their parts a fine finish. For the medical industry, the fine isotropic finish produced by CBF machines is a requirement. By running metal implants in our HZ Series machines, medical suppliers can ensure doctors and their patients that they won’t have to worry about plaque buildup, which leads to fewer complications with surgeries and procedures. Mass Finishing machines are also used by companies that produce medical devices. MFI barrel polishing machines are also great for finishing acrylics such as those used in the production of hearing aids and other acrylic medical devices and implants. In the last year with a focus on health and safety, many companies have eliminated the use of animal fats in production. MFI has developed a special corn cob blend that is free of animal fats. One of the first industries to recognize the finishing capabilities of MFI media tumblers was the aerospace industry. When jet engine makers like Rolls Royce and GE needed to debur and polish the blades on their engine turbines, they turned to the power of centrifugal barrel machines. Using the HZ-series machine, turbine blades are run in a one or two-step process. After tumbling, the blades are stress relieved and completely free of burrs and imperfections. Similarly, the aerospace industry relies on Mass Finishing machines for finishing a variety of parts from wing spars to helicopter gears and everything in between. The automotive industry provided the perfect market for Mass Finishing. Many of the hundreds of small and larger parts required to build a car motor can perform better when their contact surfaces are smooth, stress relieved and without burrs or defects. Our HZ series line of Centrifugal barrel machines are the ideal solution for crankshaft finishing and crankshaft polishing. These machines also finish small parts like push rods, gears and springs. Most recently, professionals in the racing industry from NASCAR® are using Centrifugal Barrel Finishing Machines on nearly every part that they put inside their engines. By giving their engines a fully isotropic finish (even in all directions), they’re able to achieve a surface with less friction & heat leading to more horsepower and an overall better performance. The dental industry is one of the largest users of Mass Finishing and more specifically Denta 2000 machines. CBF machines can quickly polish multiple dental partials and crowns instead of one at a time. Alternative methods of polishing dental parts include using harsh chemicals with an electropolisher or polishing by hand. These methods are much more time consuming. The dental industry is such an important client that Mass Finishing created a separate division, Denta 2000, in 1998 to cater specifically to dental labs. We now sell those same machines under our main HZ Line as the HZ-12 and HZ-40. They are impeccably suited for handling dental polishing jobs. HZ Series machines are the perfect dental tooth polishers. MFI also offers great start-up kits to get labs up and running towards higher efficiency quickly. Rings, pendants and precious metals look their best when they are free of imperfections. The jewelry industry relies on Mass Finishing machines to provide the high luster polish that their clientele are looking for. Before utilizing tumbling machines, jewelry companies polished rings and other fittings by hand. With MFI’s surface finishing and polishing machines, the jewelry industry can polish hundreds of rings or other pendants all at once. Another benefit of using our Centrifugal Barrel Machine is the isotropic or even finish in all directions leaving a perfectly smooth surface. HZ Series machines are also great for restoring old jewelry that may seem tarnished or worn out. Send us your jewelry sample so we can show you what our machines are capable of producing. Rubber is used in a variety of industries to make seals and various tubing pieces for mechanical and electrical applications. When the rubber parts are cast, they are often left with small pieces called “flash” from the liquid rubber running out of the molds. Mass Finishing High-Energy CBF machines are one of the most efficient processes for deflashing rubber. Companies that make rubber seals and gaskets utilize HZ-Series machines to complete their production process. Common rubber parts that have been finished by MFI include spark-plug covers, o-rings and other molded rubber parts. The Firearm industry uses MFI polishing machines to finish the small moving parts that make rifles and handguns fire, such as the springs and trigger mechanisms. By tumbling these parts inside our HZ-Series centrifugal barrel finishing machines, the firearm performs at its best and is less prone to jamming. Ammunition makers also rely on tumbling and vibratory machines from Mass Finishing, Inc. to polish the inside and outside of bullet and shell casings. HZ Series machines can finish hundreds of casings at once dramatically improving efficiency.